When it comes to speaking in public, have you ever felt like a prisoner inside yourself? I am too nervous in front of a group. How can I reduce my stress? I don't want to look like a fool. How can I make a good impression? I am afraid of being boring. How can I keep their interest? I am not funny. How can I make them laugh? Things might go wrong while I'm on stage. How can I avoid a catastrophe? Get back in control so you can express yourself with ease and enjoyment. End the fear of public speaking faster and without unnecessary struggles. The first part of the book describes the three conditions to END your fear once and for all. The second part provides you with 77 proven solutions to deal with whatever might happen while you are on stage. Third place in the Toastmasters International World Championship of Public Speaking, J.A. 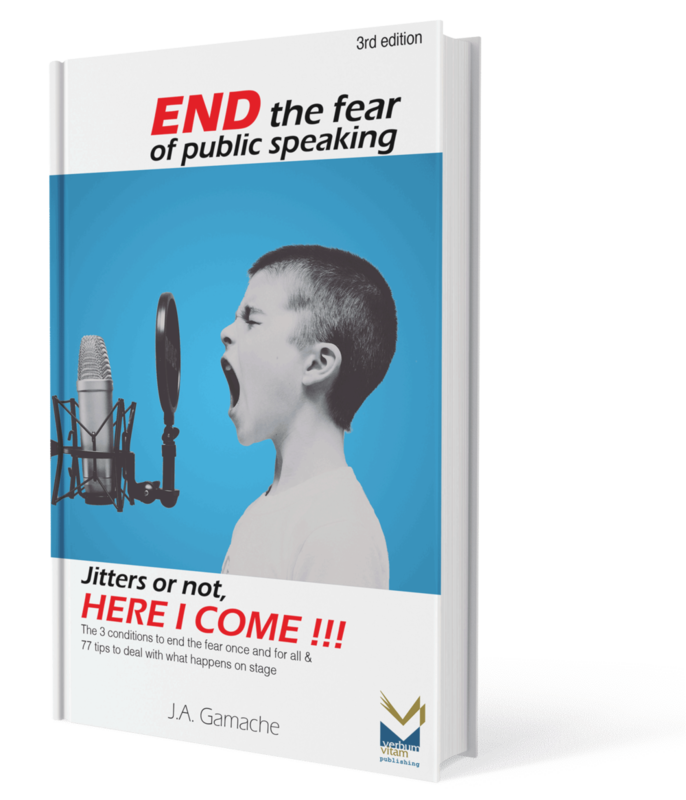 Gamache shares concrete strategies to break free from this cage called the fear of public speaking. I am too nervous in front of a group. 13 Where do I put my hands? I don't want to look like a fool. How can I make a good impression? 22 A suggestion to stop being perceived as a "know it all"
I am afraid I will be boring. How can I keep their interest? How can I make them laugh? Things might go wrong while I'm on stage. How can I avoid a catastrophe? THE WORKSHOP: Jitters or not, HERE I COME !!! I can still remember the moment. I am being interviewed in front of 350 people while judges are compiling the ballots of a speech contest I am competing in. It took me a few weeks and a few more presentations to realize that my fear of public speaking had completely vanished. At last, I could sleep like a baby the night before a speech, I was no longer panicking at the idea of speaking, actually, I was looking forward to it. I still had some jitters when they announced my name, but that feeling disappeared very quickly as soon as I started speaking. No sweating, no trembling, no face turning red, nothing! I was simply enjoying myself on stage. Talk about a difference! I always thought that I would have to deal with some kind of anxiety for the rest of my life but no, I was finally through with it. It's that realization that sparked the idea to write this book. People HAD to know that it is possible to end the fear. Not just to overcome it, but to liberate yourself from it. If you’ve ever felt like me, a prisoner inside yourself, you need to know that you don't have to remain in that state. I will share with you concrete solutions to break free from this cage called the fear of public speaking. This book is about offering you proven solutions. to end the fear of public speaking. We will tackle the negative image you may have of yourself. If you are convinced that you lack self-confidence and if you are sure that professional speakers are protected from this fear, you will learn that this is not the case! You will realize not only that your fear is a normal behaviour but that it is also often desirable in many circumstances. You will learn that it is natural and even legitimate to experience high levels of anxiety when you do not speak regularly in public. And finally it will become obvious that using the three conditions will end your fear of public speaking once and for all! to deal with whatever might happen on stage. A big part of the fear we experience is not knowing how to deal with unexpected situations when in front of groups. That's why I created 77 tips for you to learn how to avoid these unpleasant surprises or at the very least, to know how to deal with them. These tips will greatly shorten your learning curve. Instead of feeling vulnerable when something unexpected happens, you will have the tools to deal with these situations. I drew these ideas from my experience and also from exchanges with friends who also work in the world of communication. All these principles allowed me to win third place in the World Championship of Public Speaking organized by Toastmasters International. so you can express yourself with ease and enjoyment. I have had to struggle for many years to liberate myself from the fear of public speaking. This book is about helping you to arrive at the same place, but sooner and without the struggle. If you are reading this book, it is because you know deep down you have something important to share with others. And it would be a shame if you did not because of fear. We need your expertise, your knowledge, your wisdom. Since I have put an end to my fear of public speaking, I feel free to reach for old dreams hidden deep in the drawer of my heart and I realize them one by one. This book is one of those dreams. My wish for you is to liberate yourself, in other words, to end your fear of public speaking, so you can finally realize your dreams. A Bachelor in Business Administration, J.A. Gamache is a bilingual speaker (French and English) from Montreal, Canada. His presentations are humorous and inspirational, and motivate audiences to take action immediately. He has held the position of President of the Montreal Chapter of the Canadian Association of Professional Speakers (CAPS). A proud Toastmasters member, J.A. Gamache is the only Quebecer to have won a podium (3rd place) at the Toastmasters International World Speakers Championship and was one of 10 finalists in the same contest four times. More than 35,000 speakers compete in this prestigious competition each year.